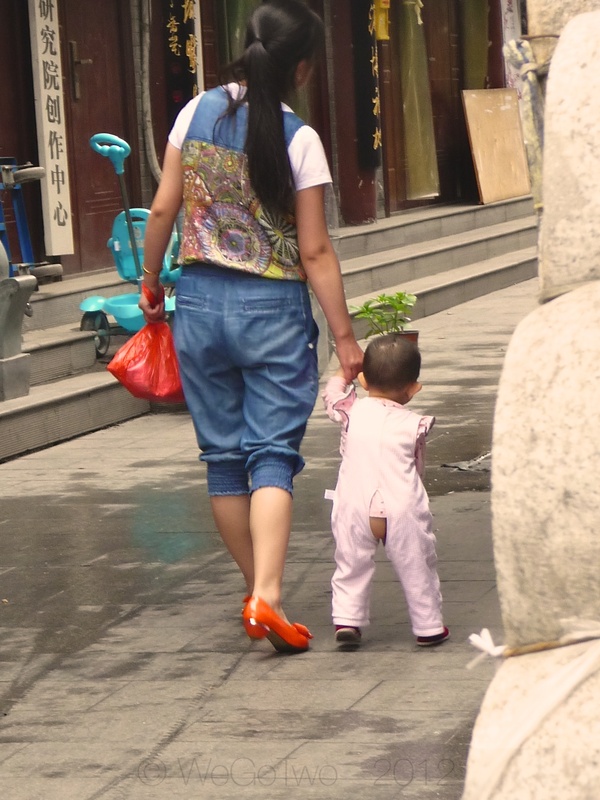 One of the many things that attracted our attention in Xian was the proliferation of babies and toddlers baring their bottoms. 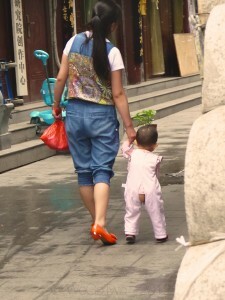 We thought, at first, that the “holey” pants were due to wear and tear and that given many people in China are not particularly wealthy they simply could not afford to purchase new pants for the growing toddlers. How wrong we were – oh so naive. In fact, it wasn’t until we read an article in a local expatriate magazine (Xianease) that we realised why babies and toddlers were baring their cute little buttocks for all to see. The Xianease article (titled “Fresh Breeze”) pointed us in the right direction – the split pants are designed “to allow the wearer to lighten themselves wherever and whenever they please.” And, as it turned out, we witnessed just that – toddlers happily and unashamedly relieving themselves as required. Whilst hundreds of bare bottomed youngsters running around the streets of Xian might seem strange to us Westerners (we didn’t actually see too many to be honest) the reality is that it is very much the norm in China. Another reason for this continued display of flesh is that many Chinese families simply cannot afford expensive diapers (nappies to us Australians) – cloth and an “as is, where is” acceptance is cheap and convenient. So, if you haven’t been to China before and you are planning a visit don’t be too concerned about the sight of cute little derrieres hanging out of pants that look like they have had to “bum ripped out of them”. It is all a part of the scenery in China. A final point to note: It has to be good for the environment so thumbs up (or is that “bottoms out”) to the people of China. This entry was posted on Saturday, May 12th, 2012 at 10:30 pm	and is filed under Asia, China, On The Road. You can follow any responses to this entry through the RSS 2.0 feed. You can leave a response, or trackback from your own site.